A Rinkya Blog: Mario Kart Wii Japan Rumors! EXPLORING JAPAN COLLECTIBLES, CULTURE, FASHION, GADGETS AND MUCH MORE!! Rinkya Inc. - Helping you Bid on Yahoo Japan Auctions & purchase from Japanese shops on-line. Mario Kart Wii Japan Rumors! My personal favorite game ever, is Mario Kart-- and we are now hearing rumors of a Japan release date for the Wii Version!! 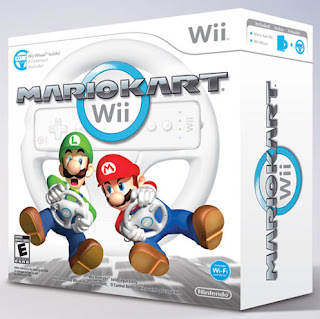 If the rumors are true, it will launch April 10th and will be bundled with Wii Wheel! It will include 32 courses, a remake of classics and some newbies. You can also play as your Mii, if Mario or Luigi is not up your alley. Previously confirmed, Mario Kart Wii boasts a 12 player online multiplayer so you can compete with players anywhere! Nintendo had announced a Spring release date for the game, so hopefully no delays will occur. Rinkya Japan Auction & Shopping Service provides service for everything Japanese to users all over the world! A Rinkya Blog is a labor of love for everything Japan has to offer- we hope you enjoy reading! Like Rinkya on Facebook & Follow laurelrinkya on Twitter for exclusive discounts & promos! Subscribe to A Rinkya Blog!! Winter Wonder Festival 2008 Items Available!! Ponyo On A Cliff Image Revealed! Pooh & Friends Dress Up Your Best Friend! The Pillows Come to America! X Japan Adds Another Concert To Reunion Tour! McDonald's New Menu Item Has Heart! Are you on Facebook? Rinkya Is! Top Ten Charity Auctions on YJ 2007! Featured Feed- Tokyo Japan Times!